Our imams are some of the most experienced and esteemed in the San Francisco Bay Area. Together, the imams of Halal Weddings have performed over 3000 islamic wedding ceremonies (nikahs). Through this online booking platform they are looking forward to being part of the beginning of many more muslim marriages. Born in London, England, Tahir Anwar has lived in the San Francisco Bay Area since 1983. Upon completing his religious studies in India, he has been serving as the Imam at the Islamic Center of San Jose, since 2000. He is the founding board member of Averroes High School, the Bay Area’s first Muslim high school. He teaches Islamic Law at the renowned Zaytuna College, America’s first Muslim liberal arts college in Berkeley. He is currently the chairman for the board of NISA, North American Islamic Shelter for the Abused, an organization that works towards alleviating issues related to abuse and domestic violence. NISA also runs a shelter for abused women in the Bay Area. He’s also the founding board member of Islamic Art Exhibit, and annual traveling exhibit rooted in the Islamic tradition. He sits on the Executive Committee for Islamic Society of North America (ISNA), the country’s largest Muslim umbrella organization. He has a passion for community service. He served on the Human Rights Commission for the City of San Jose for over 5 years, and the Human Relations Commission for the County of Santa Clara for one year. He also leads a group for Hajj each year, which has been covered by CNN twice. Shaykh Alauddin El-Bakri was the Founding Board member of IMAN: Inner-City Muslim Action Network. At Chicago. An organization dedicated to educating and lifting up the the inner cities. In 1999 He accepted the role of Chief Curriculum Designer and Book editor at IQRA, Chicago. In 2005 he was a founding board member for My Dean at Fresno. An organization dedicated to activating Muslim youth in faith and life. In 2010 Founded Support Life Foundation. An organization dedicated to education and job training at the inner cities of Oakland, San Francisco and San Jose. In 2017 he founded Tawasaw.org - An organization dedicated to educating Muslims on how to apply islam in their modern daily life. He is a regularly invited guest speaker to high tech companies and universities to lecture about Islamic faith, culture, history and people. Currently he serves as an Imam of Saratoga Mosque. At Dartmouth, Imam Dawood provided spiritual and religious support, offered educational seminars and lead congregational prayers for Muslim students at Dartmouth College and residents of the greater Hanover area. Imam Dawood also worked to foster understanding and dialogue among diverse campus groups by building and maintaining interfaith relations. During his residence in South Africa, Imam Dawood converted to Islam and then spent five years in Damascus studying Arabic, Islam and spirituality. Upon completion of his studies he relocated to New Haven, CT where he served as Imam of Masjid Al-Islam. While in New Haven he also worked as a teaching assistant and engaged in research at Yale University. Imam Dawood also served as Director of Outreach at the Zayed Center for Islamic Culture in the United Arab Emirates, engaging in public speaking within U.A.E. and abroad, emphasizing ethics and tolerance between Muslim and non-Muslim communities. Imam Dawood spent four summers from, 2008-2011, teaching Level I Arabic at the Zaytuna Summer Arabic Intensive. He is currently the Director of Student Life at Zaytuna College. Since 1997, Syed Mubeen has taken classes with Sheikh Hamza Yusuf, Sheikh Muhammad al-Yaqoubi, Imam Zaid Shakir, and many other visiting scholars, and maintains his Islamic studies. In the past he has served as Zaytuna Institute’s President, and as Hamza Yusuf’s assistant. He is currently the Vice Chairman of the Board of Trustees of Zaytuna College. He is a guest lecturer at the Saint Mary’s College MBA program and has been featured as a speaker in various MSA forums, Islamic awareness activities and has conducted Islamic sensitivity training programs for ER Physicians in California. Syed Mubeen has been mentoring and teaching male youth at the San Ramon Valley Islamic Center (SRVIC) since 1994, and has participated in the San Ramon Valley Interfaith Council. Syed Mubeen resides in Northern California with his mother, wife, and two children. Qari Amar Bellaha was born and raised in Morocco where he studied Quran and Tajweed from the age of 7. He memorized the Quran at 17 from Madrasat Imam Nafia. He has ijaza for the Hafs and Warsh forms of Qur’anic recitation. In 1994 and 1995, he was awarded top prizes in the National Moroccan Tajweed competition. He is recognized for the beauty, clarity and excellence of his recitation and is one of the Bay area’s foremost Qur’an teachers. He currently teaches at Northstar School, Zaytuna College, MCC East Bay and privately. He lives in the Bay Area with his wife and three young children. Abdullah bin Hamid Ali is the head of Zaytuna College’s Islamic law program. He teaches family law, inheritance law, business law, jurisprudential principles, and hadith science at Zaytuna College. He is a lifelong student of the Islamic tradition being born to Muslim parents having begun a serious study of Islam in his early teens. He attended Temple University for 2 years (1995-1997) prior to pursuing studies that culminated in a 4-year collegiate license (ijaza ‘ulya) from the prestigious Al-Qarawiyin University of Fes, Morocco (1997-2001). He has also served as adjunct professor of Arabic at UC Berkeley (2013), and adjunct professor of Intro to Islam at the Graduate Theological Union (2014). He holds a BA (ijaza ‘ulya) in Islamic Law (Shar’ia) from the prestigious Al-Qarawiyin University of Fez, Morocco, an MA in Ethics & Social Theory from the Graduate Theological Union, and is involved in PhD dissertation work in Cultural & Historical Studies of Religion at the Graduate Theological Union (Berkeley). 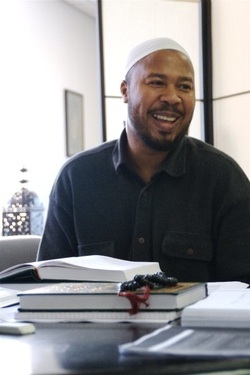 A native of Philadelphia, PA, Abdullah relocated with his family by invitation from Zaytuna College’s Board of Trustees in 2007 to the Bay Area to instruct pilot seminarians in the Islamic rational sciences (theology, legal theory, hadith science) after spending 5 years as assistant full-time chaplain at the State Correctional Institution of Chester, PA (SCI Chester). Abdullah is a very active member of the Bay Area community who regularly delivers the Friday service address at a number of mosques and conducts regularly scheduled online classes. He is the official Imam of the Unified Muslim Community mosque of San Leandro and a member of the board of directors of the Northstar Islamic School.